The Hawaiʻi H.O.M.E. Project was founded in August of 2005 and our first free clinic began servicing homeless individuals in May of 2006, with the opening of the Next Step transitional shelter in Kaka’ako. 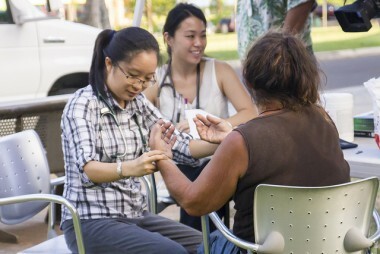 The mission of our program is to improve quality and access to health care for Hawai’i’s homeless, while increasing student and physician awareness and understanding of the homeless and their healthcare needs. their educational curriculum and as volunteers. The students are supervised at all times by faculty physicians from the medical school and volunteer physicians from the community. The funding for our clinic services comes mainly from donations, fund raising activities, and grants. The physician supervisors all volunteer their time to work at the clinic. JABSOM med students providing free health care to homeless patients.